Oversize charge applies on dimensions greater than 6.69 in. / 17 cm. 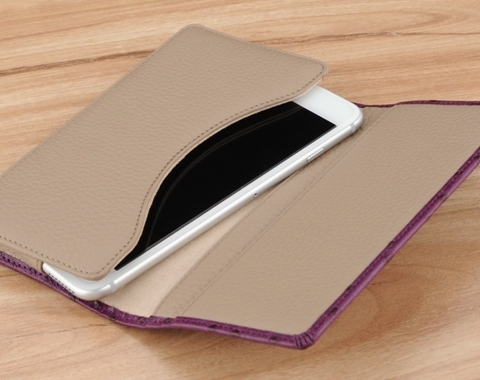 Genuine leather handcrafted leather wallet case customizable for all phone makes and models. If you have a protective case or extended battery, we can tailor it to fit. Using the finest workmanship, our team of leather artisans beautifully tailor the case to fit with your choice of over 100 different genuine leather colors and textures to make it uniquely yours. I had been looking for a leather phone case, for my Note 4, for a long time. Story Leather has multiple styles - I found what I wanted. In addition, an amazing selection of colors and finishes are available. I was impressed to say the least, and when I received my phone case, I decided to order a card holder to match. I recently received it and couldn't be happier! Your quality is amazing! I've shown them off to co workers and friends. Thank you for making such a beautiful case for my Apple device. I'm very pleased as to how it turned out. It was made exactly as I specified in my order. I would like to wish everyone a Merry Christmas and a wonder New Year 2016. 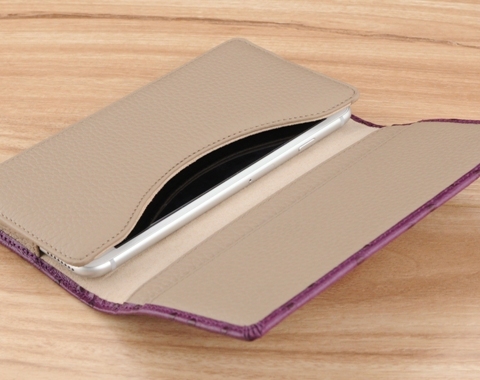 The phone wallet is a beautiful well made product. And it fits my iPhone 6s perfectly with the cover on. The ability to customize is such a great feature. I would most definitely purchase products from Story Leather in the future. I bought a Lifeproof case for my iPhone 6plus which made it difficult to fit in a "wristlet ". I found Story Leather on line. I contacted them to find out if any of their cases were large enough. I was advised about the Verano. They did charge me $20 extra because the case made it one millimeter bigger than the site specified design. It took almost six weeks to get but they tell you that. I loved being able to design it myself. 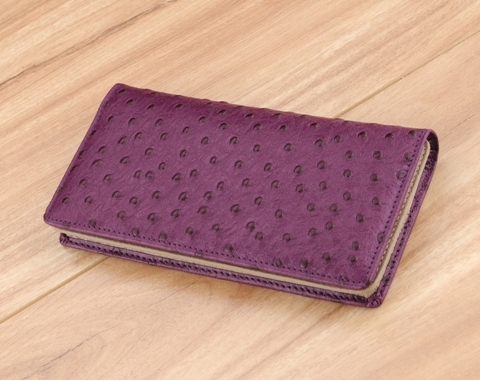 I love the ostrich style purple leather. The magnetic closure is very secure. The zipper outside pocket and inside sleeve give enough room for money and cards. I would recommend them and purchase from them again. After years of carrying inferior phone cases that would fall apart I decided to invest in a better quality phone case. That is when the search began. 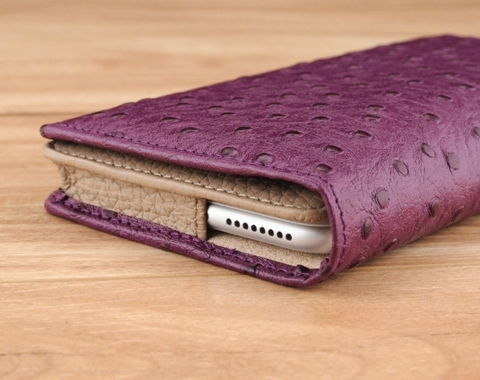 I eventually found Story Leather and ordered the phone case built exactly how I wanted it. It arrived in the time that was promised. I think the craftsmanship is amazing! I will only purchase story leather products. I can not believe the high quality. I have shown the phone case to all my friends. I appreciate the work of the people at story leather. I am absolutely thrilled with my phone case, well made and beautiful! I love my new iPhone 6 case. The colors are unique and and vibrant and you can tell it is excellent quality workmanship. I would highly recommend Story Leather to any of my friends. I plan to order another case as a Christmas gift. I bought a black leather case for my iPhone6+. Took a month to get but worth the wait. Beautiful workmanship. Classy, fits perfectly and the perfect case for such an oversized phone. Received many compliments from others when they see it. There are so many ugly cases available. I was pleased to find Story Leather and what promised to be a well-made, tasteful case; now I'm thrilled to have the real product in hand. It's beautiful! After getting an iPhone6, I needed a new case with really specific requirements, as I manage a large event. I needed the case to clip on to belt or binder, and to be able to carry it in my hand, so a hand strap is a plus. I also use magnetic key cards and carry cash and a credit card, since I don't carry a purse. The fine folks at Story Leather kindly answered my questions in two different chat sessions. After I placed my order a rep called me and actually suggested adding a 3rd pocket (hidden behind the phone) for added storage space. The phone case arrived and it has exceptional workmanship, made with quality leather. I ordered plain black all around, and now wish I'd gotten a bit more creative with the colors! Maybe my next phone. It's so refreshing to work with a company that clearly takes pride in their product and cares about their customers. I'd recommend Story Leather cases to anyone. The best things in life are worth waiting for. Beautifully made, the leathers are beautiful, colors vibrant, very good value for the price. I couldn't be happier, and I can be very tough to please. Excellent job. I'll purchase from you again. I'm also telling everyone I can about your products and websits. Perfect in every way. Fits precisely even with the Mophie. So impressed with the selection of styles, leathers, closures, customizations. Truly the very best of attention to every detail. Just got this case as a birthday gift to fit my brand new iPhone 5S, the stitching was perfect and now I can carry my phone and wallet altogether. Thank You! First case was too large so gave dimensions of phone itself only even though I was using a protective case also. The second case fits better. I think they are made a little over sized. Didn't get a discount off 2nd attempt at case just a free key pouch which is actually kind of useful. quality of leather and Stitching seems to be good. Will get another made to fit my next phone. takes a while to arrive but worth it. I got my HTC One in April. All during that time I've looked for the "right" leather case, and even tried two. They were poorly made and only came in black. Then I found your site. The color choices and leather choices amazed me, but I hesitated because of the price. After a few weeks, I broke down and ordered the Verano in purple as a treat for my new job. When it arrived it came in packaging worthy of an elegant gift. The case, itself, is gorgeous and so well made. I was so pleased I ordered the Double Decker for my work and personal phone in red. Now I have a cell phone wardrobe! I have bought 2 verano cases, and both are excellent quality. I will purchase again. Can I make this case to hold a camera? We can make this case to fit any device as long as we have the proper dimensions. However, for cameras, we do not recommend DSLR cameras with these cases, a simple snap and go camera will be more suitable. Please do note that we do charge an oversize fee when cases have dimensions greater than or equal to 6.69 in. / 17 cm. This fee will vary depending on the dimensions provided. You will be informed of the fee after your order is reviewed by our production team. Do you ship International? How much to ship to Singapore? I don't want a purple case, can I have this case in another color? Can I make the card slots to be oriented the long way? so that the cards are vertically inserted so allow for more cards?? Yes, we can make the card orientation to be vertical card inserts. However, please do note that we would not be able to use a magnetic closure (the default closure type for this case). So a snap button closure or belt tab closure will need to be used to ensure the cover can be properly shut. Please note this in the Special Request section as you custom build your case.